Modern technology has made recording devices smaller, more powerful and more affordable than they ever have been. Handheld recorders can be used in a variety of situations. They are perfect for university lectures, collecting field recordings and taking personal voice notes. New devices record in very high quality and age well. Buying a new recorder is an investment that will last a long time in most cases. If you are in the market for a voice recorder it is best to educate yourself on what makes a recorder a great buy. Below you will find the best picks to help you in your search. The top choice and Gold Pick Winner is the ICD-AX412 from Sony. 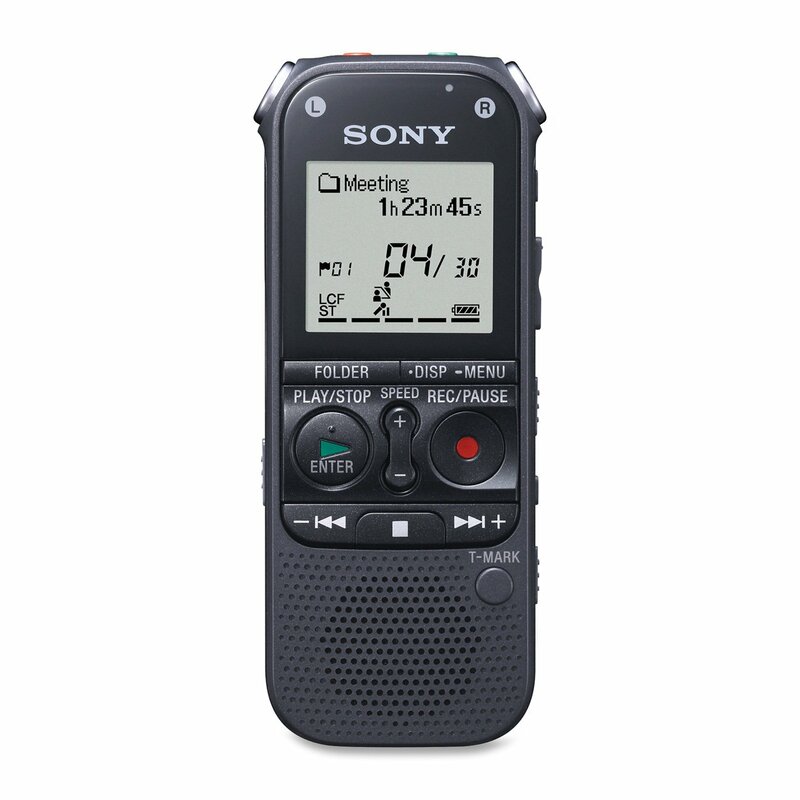 This digital recorder ranks so high because of its massive storage, long battery life and recording power. It is affordable and small making it great for bringing it with you no matter where you go. Read on to discover why it is considered one of the top portable recorders you can find. The first part about the ICD-AX412 that makes it an amazing purchase is the fact that it comes with 2 GB of storage space. This allows you to record around 500 hours of SLP mono audio. It can be upgraded with up to a 16 GB SD card. With the added space you can expect to hold closer to 4,000 hours of audio. This is an incredible quality that gives you maximum freedom when choosing what to record. If you choose to always record in HQ stereo quality you can expect closer to 23 hours which is still more than many other similar recorders. All of the buttons on this device are laid out in a focused fashion. The biggest ones are the play button and record button. Fast forward, rewind and stop buttons are all located below the bigger two and do not get in the way at all. Volume control is conveniently placed on the side of the device for smooth shifts in sound level. The recording quality is excellent on this device. It records in stereo with use of the omni-directional microphone for prime sound quality. Files are recorded as 192 kbps MP3 files which allows easy transfer to any number of playback devices without the need to convert anything. This device also utilizes a Noise Cut feature that will remove excess background noise so that you can better hear your recordings. The Low Cut option will roll off the low ends to keep the sound clear without any extra low end rumble. These options add to the power of the ICD-AX412 as a premium handheld recorder. You can use the Scene Select function to choose where to begin your recording. This allows great freedom in organizing your different sessions. You can place track marks to remember certain locations in each recording. Playback speed can be sped up to 2x normal speed. Doing so does not alter the pitch of sound thus making listening to those longer sessions quicker and more efficient. You can also A/B different locations in each session for fast switching between key points in the recording. Voice Operated Recording, or VOR, is included on this device which makes for quick recording access no matter the setting. The LCD screen is well-designed and allows you to organize you files and folders with ease. There is no one click recording option but setting up a new recording is fast and simple. This device is extra lightweight. It weighs in around 3 ounces. It is only 4.5 inches tall making it an ideal option if portability is a concern of yours. It will fit in shirt pockets, backpacks and most places where you might want to throw it. If you really want to maximize the life of this device you could always grab an optional carrying case for it that will guarantee further protection from the usual wear and tear of everyday life. Everything about this device is made for quick use, efficient functions and maximum storage capabilities. You will not regret making the ICD-AX412 your go-to recording device. It can be purchased for $230. For the price it is the hands down top choice for a portable recorder for the student, businessman, musician or anyone with a desire to capture sound on the go. 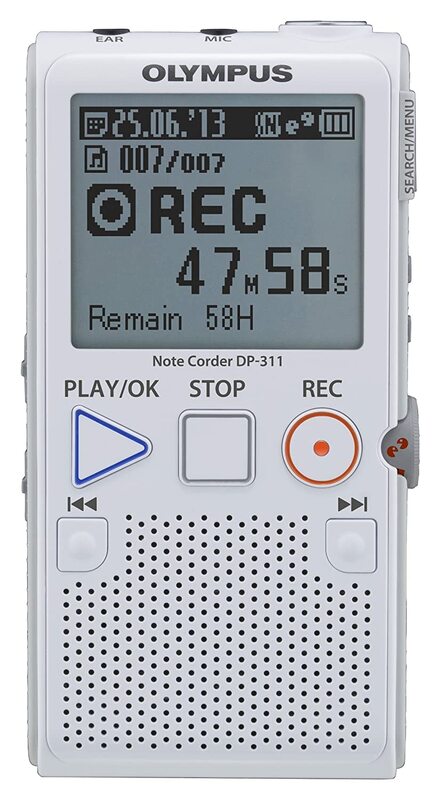 Number two on the list and the Silver Pick is the Digital Voice Activated Recorder by Dictopro. 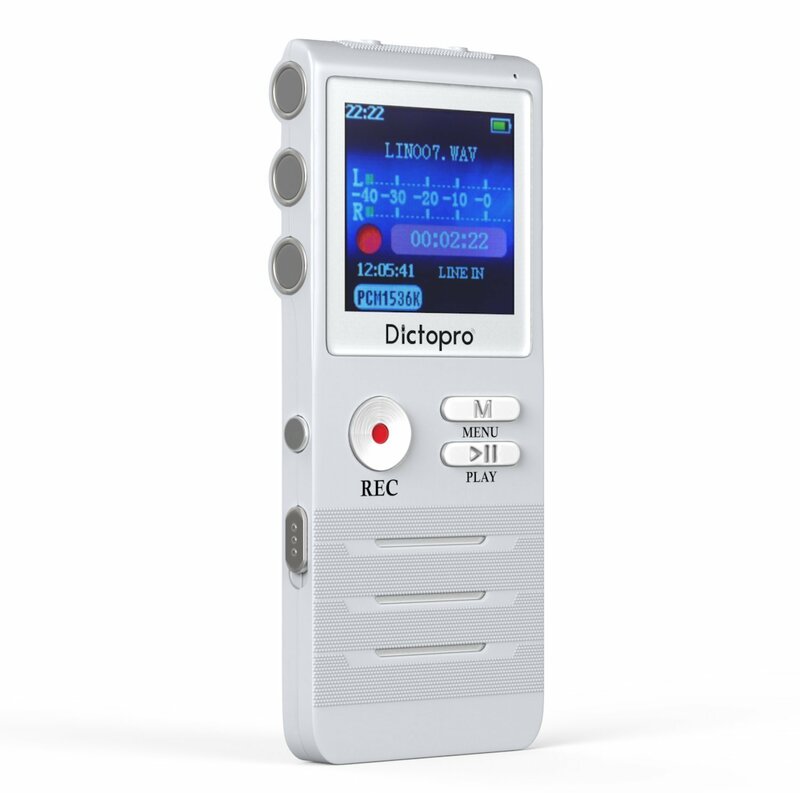 Dictopro has made a sturdy device that features a solid body, large storage and top quality microphone for ensuring professional sounding recordings in a flash. It is easy to use and is ready to go out of the box. 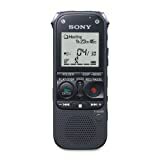 The body of the Digital Voice Activated Recorder is made of durable aluminum that is also very light weight. This device is small but strong. It fits in your hand with no problem and feels natural. It weighs just 5.6 ounces and will not fatigue you for those times when you need to get some extended recording done. The LCD display is a cool blue color that is easy on the eyes and adds to the efficiency of the device. The recording button is the main button on the front panel. It is next to the menu button and the play/pause key. Other control buttons are situated on the sides of the recorder and do not get in the way of the recording process. The design is smart and keeps user friendliness in mind. The internal storage is quite large for a stock item. It holds up to 8 GB of data. This allows for around 700 hours of recordings right off the bat. This will grant more than enough space for the average and above average users. Files are saved as either an MP3 file or a WAV file giving you some choices in the formatting. This is key if you want to save space. MP3 is smaller but not quite as high fidelity as a WAV. Another amazing feature is tha tyou can use this device as a portable music device if you choose. It can playback MP3, WAV, APE and FLAC files with no issues. This extra use might be attractive if you want to get the most out of your recording device. Other devices do not also function as an MP3 player so this makes the Dictopro something special. Recording is done with the Voice Activated/Operated Recording or by hitting the record button. This grants you some freedom of choice depending on the situation. For quick recordings you can use your voice to get it going. Files are accessible in the LCD that has a backlight for viewing in low light. The two high quality microphones can pick up sound from over 40 feet away. They are very sensitive and can also pick up low-volume sound with no problem. Transferring your recordings and files to and from a Mac or PC is simple with a USB cable. Other file types can be stored on this device making it ready to be used as a flash drive. This multi-functional aspect of the Dictopro makes it one of the most powerful recorders you will find. It runs around only $60. If you want something to record everything that you might need and more go with this device. It is a top pick and will not fail to deliver a quality recording experience. The Bronze Pick comes from Olympus. Olympus is a household name when it comes to the world of photography, medical observation equipment and recording devices. Since 1919 they have brought great products to millions of customers. Their DP-311 Voice Recorder continues in the tradition of innovative products that deliver as needed at an affordable price. With this recorder you will get plenty of recording space and other features to make it a solid choice. Storage capacity sits at 2 GB out of the box but can be upgraded with an SD card for extra saving space. Stock you can get around 166 hours of recordings out of it but if you want much more be sure to go with a 32 GB SD. Files are saved as high quality MP3 files and can easily be transferred to and from a PC or Mac. The microphone is wide and will capture sounds from near and far. Its power allows you to capture those whispers that you might need to save for later or record that low speaking professor at the front of the classroom. Recording range is from 70Hz to 11kHz making it a great option to get recordings of many different situations. If you need to capture a quick musical idea you will be able to hear most nuances in the sound, minus the deeper low end of the spectrum. An added stand comes as part of this recorder. This gives it the ability to be places on most surfaces in order to get a stable recording without the need to hold the device. Other extra features include a Calendar Search that lets you search through the device by file name or date and quickly pull up what you need. The LCD is large and basic and will not distract from the functionality of the DP-311. The Mode Dial allows you to choose what kind of environment you are in and set the recorder to match. You can choose between music, memo and conversation styles. This is a nice little extra that gives you more to play with when it comes to making a new recording and brings the art of handheld recording to a new level. Accessories are abundant for this product. You can buy a telephone Recording Device if you want to save those important phone calls. A Noise Cancellation Microphone can be picked up and will add even more quality to your recordings by eliminating more background noise and sonic chatter. Upgrades are one of the fun parts to owning the DP-311 as you can customize it to fit any use. This makes it one of the bets field recorders available today. The DP-311 costs between $60.00 and $70.00 at most retailers. This is a fair price considering the features that come with this device. If you want a device with a built in stand, environment selectors and a great frequency range than you will love what Olympus brings you in the DP-311. Give it a go and see what so many users love about it. There are times in life when spending large amounts of money on electronics is out of the question. Finding a recorder on a budget is not impossible, however. 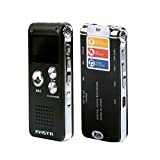 Whether you are on a budget or just want to test the waters of field recording the Evistr Portable Digital Voice Recorder will save you money and still bring you high quality recordings. It keeps you Ballin’ on a Budget with style and reliability. The Evistr device comes in a slick black design. It is sturdy, durable and lightweight. It has an internal storage of 8 GB. While it cannot be upgraded any further it still gives you plenty of recording time. With the USB 2.0 connector you can put your recordings onto your computer for more space. It has a lithium battery that will last around 20 hours when recording. For most common uses this is more than enough. The battery is rechargeable so there will never be a need to keep switching out old batteries. It also functions as flash drive and MP3 player. For a budget device that is more than expected. You can even hook it up to a telephone with an adapter to recorder phone conversations making it perfect for spies and prank callers alike. The recordings can be set to start whenever a sound is heard and paused when sound stops. This is great for long meetings, lectures and personal note taking. All files are stored as WAVs. This is one of the downsides as you will be limited in your file format choices unlike some of the previous devices listed. WAV is high quality but also rather large. 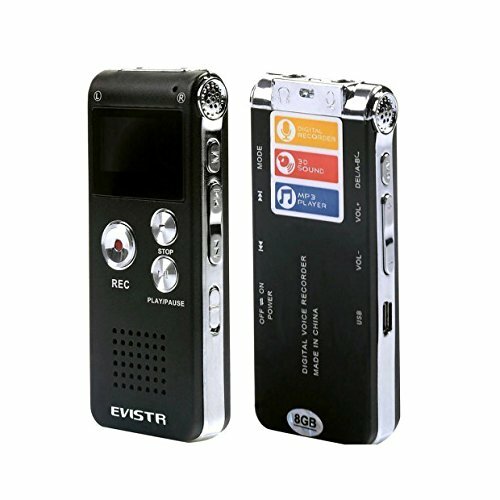 Other functions include an A/B repeat, tiny size, one button recording and two internal speakers. It has enough features to be considered a good device but is not quite as well-made as others on the market. For the price of $16.00 it is a bargain that is hard to pass up if you need something efficient, light and of enough quality to survive many recordings. The last thing that you want to worry about when clicking the record button on your recorder is running out of storage space. If you have too little space on your device you will miss out on something that could be vital to your lecture, meeting or musical creation. Be sure to look for devices that have a minimum of 2 GB of storage space on them. If you need more space and can afford to spend a little more money search for those devices with at least 8 GB. Some 8 GB recorders can be found for reasonable prices. Some devices will allow for memory upgrades by adding a SD card. Keep that option open whenever you buy a recorder. You never can tell just how much space you might end up needing. This is especially true if you want to make your device double as a flash drive or MP3 player. The more space the better in those situations. Not all recorders have slots for SD cards so read up on what your new devices can do before buying it. Owning a recorder with good battery life is vital to getting the most out of your device. If your battery is drained after only a couple of uses you might want to consider finding something that can go for around 20 hours before shutting down. This ensures that you will not miss out on something important. You never know when you might need to start recording, and having a long lasting battery life keeps you ready to record at all times. Some devices have rechargeable batteries while others use disposable batteries. If being environmentally friendly is something that you try to live then go with a battery you can reuse. Also consider the long term cost of always needing to buy new batteries. You will get the most use out of your money if you grab a recorder with a removable battery that can be recharged. A rechargeable battery also keeps you recording on the go. If you are out and you need a quick charge some devices will allow that while others will not. Weigh your intended uses and how often you intend to carry your device with what comes stock in the device. The most important factor to consider when searching for a new recorder is the recording power. This almost goes without saying but it is good to go with a device that can capture quiet sounds as well as those that are further and louder without clipping and other audio fractures. If you plan to use your recorder for music you might want one with a powerful low end microphone. Watch for a range of about 40Hz to 19kHz if you want the best frequency range for recording music. For average uses a microphone that can pick up frequencies from 70Hz to around 11-12kHz is powerful enough. Read what other users have to say about the microphone quality on the recording device. If they complain about not being able to hear what they record you should move on and keep looking. Audio recorders with 2 microphones generally offer you the best quality and more than likely can record in stereo, a feature that is key to getting the best quality recording on the go. Walking around with a heavy device is not fun. If you want a portable recorder try to keep the weight between 2 and 6 ounces. This will not weigh you down and will keep you from feeling burdened just because you chose to carry a recorder with you. Look for materials that are either high quality plastics or lightweight and durable aluminum. These will grant you low weights and sturdy designs in most cases. Portable recorders are purchased to be used on the go so look for a device that is small. A device that is no more than about 5 inches tall and 2 inches wide is ideal. The smaller the better if you plan to carry it often. Make sure that if it is small that it is still powerful enough to capture great recordings. An optional feature to look for when buying a new recorder is the amount of accessories that the device supports. While it is not necessary to grab a device with accessory support it can be something to keep in mind if you plan to use this recorder all the time and in many different recording situations. If you are shopping for a new voice recorder you have dozens upon dozens of options. It can be intimidating to find the best device but with enough research and time spent reading about the offerings you will find one that works best for you. Consider what you might use the device for and go with the one that caters most to that type of recording. For a student or business man or woman you might want a recorder that fits in your pocket, purse or laptop case and will not weigh you down and take up too much space. For a musician you want a recorder with a wide frequency range that might have a built in stand. There are plenty of quality devices to choose from and with some studying soon you will be recording in style.